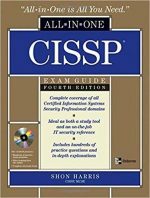 Building on the popular Sybex Study Guide approach, CISSP: Certified Information Systems Security Professional Study Guide, 4th Edition provides 100% coverage of the CISSP Body of Knowledge exam objectives. Find clear and concise information on crucial security topics, practical examples and insights drawn from real-world experience, and cutting-edge exam preparation software, including two full-length bonus exams and electronic flashcards. Prepare yourself by reviewing the key exam topics, including access control, application security, business continuity and disaster recovery planning, cryptography; information security and risk management, and security architecture and design telecommunications and network security.